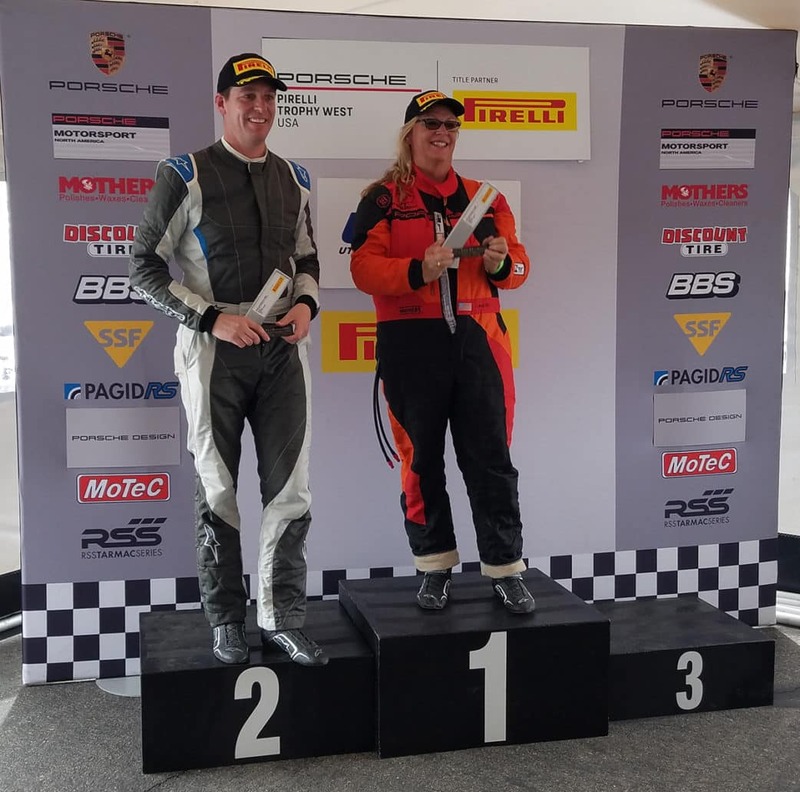 Salt Lake City, Utah – On a picture-perfect warm and sunny day at Utah Motorsports Campus, Kevin Woods and Laura Ely each took overall victories in the hotly-contested Race 6 of the Pirelli Trophy West USA. It was a well-populated and competitive paddock as 27 Porsche GT3 and GT4 Cup Cars in five different classes contested the second of two races this weekend on the 3.048-mile, 15-turn outer road course located near Tooele, Utah: Diamond and Diamond Masters (2017-2018 991.2 GT3 Cup), Platinum (2015-16 991.1 GT3 Cup), Silver (Cayman Clubsport GT4 MR) and Bronze (2016 Cayman Clubsport GT4 Trophy) classes. 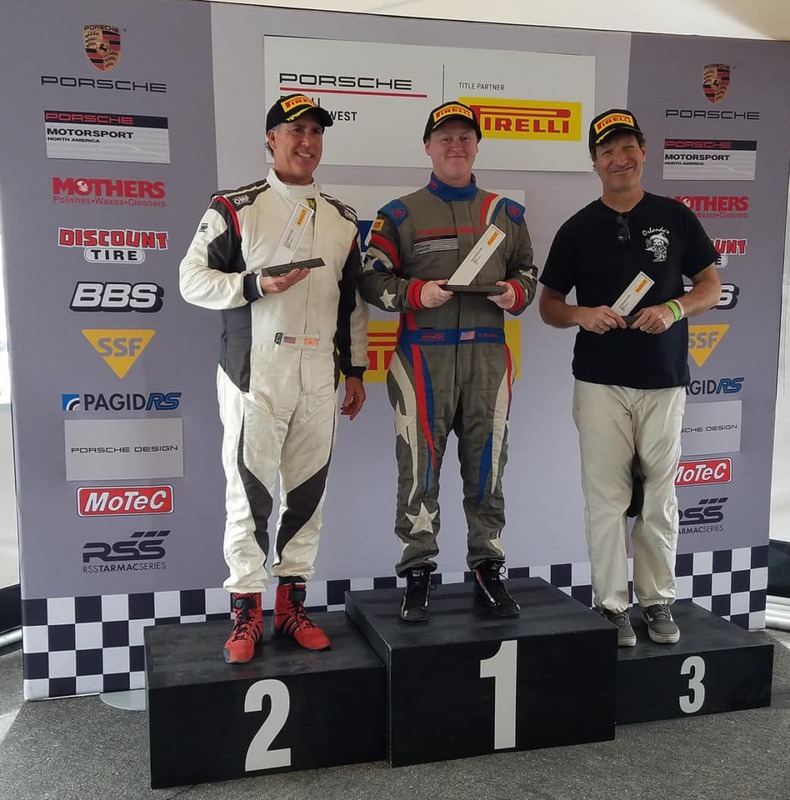 The classes were split into two races, with Diamond, Diamond Masters and Platinum (GT3 Cup) in the first race and Silver and Bronze classes (GT4) in the second. 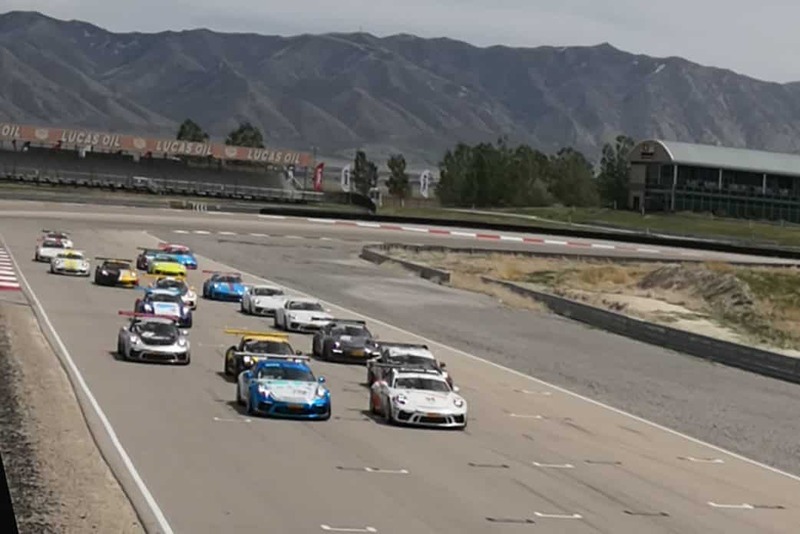 The GT3 field brought the heat from the drop of the green flag, bunching up four-wide toward Turn 1 before sorting themselves out nicely through the tight left-hander. Woods held a slim lead in his No. 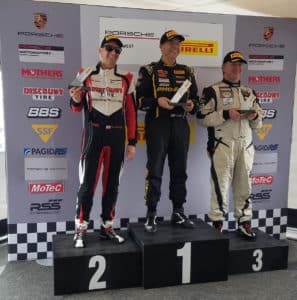 94 Mothers Polish/TruSpeed Autosport Porsche over Loren Beggs but could not shake the 911 Design driver until Lap 17, when Beggs spun in Turn 5. Woods maintained his composure to take his fourth victory of the season, with Beggs second. 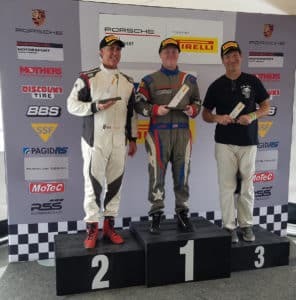 Behind the race front-runners, Diamond Masters class leaders (and Competition Motorsports teammates) Preston Calvert and Michael Zuieback battled throughout the 19-lap, 40-minute flag-to-flag race with the class win and the final overall podium position on the line. Zuieback gave Calvert several hard looks, but Calvert held him off for his first class victory of the season. Sean McAlister, driving the No. 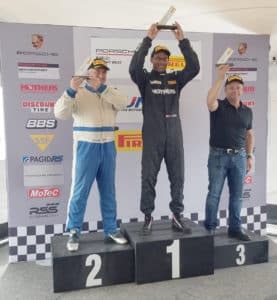 00 Competition Motorsports, took his sixth straight Platinum class victory after a race-long clash among the Diamond class competitors. 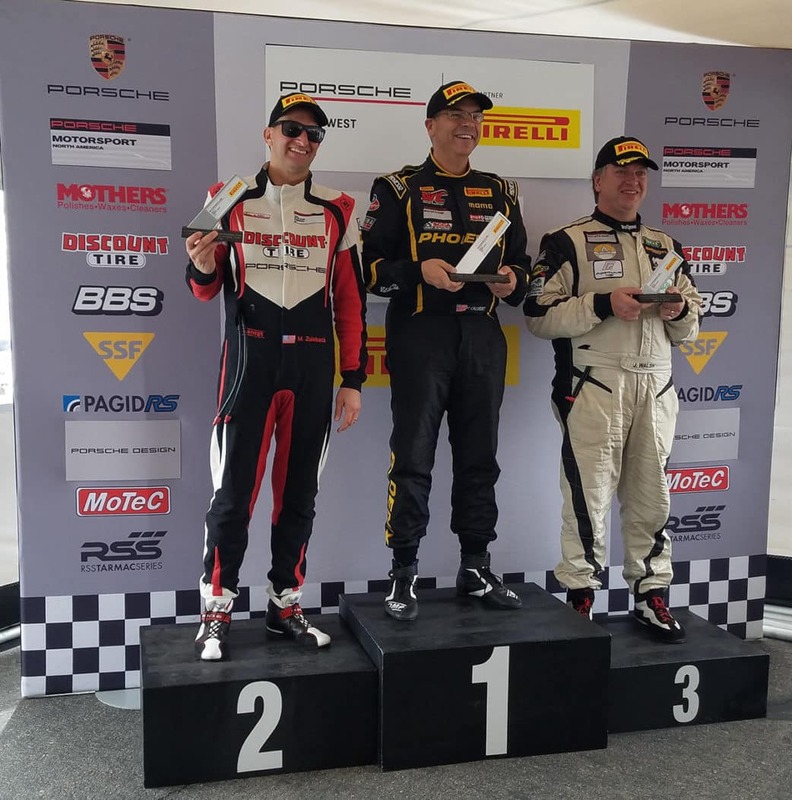 While not having the sheer numbers of the GT3 classes, the GT4 race made up for it with added excitement and close competition. 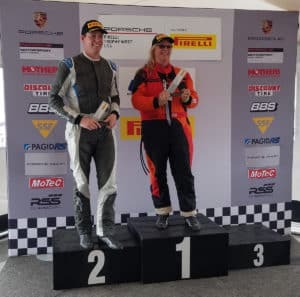 Black Sheep Racing’s Laura Ely started alongside Chris Bellomo (The Racer’s Group) and the pair held that side-by-side battle through a heart-stopping five corners, with Ely taking the position in Turn 5 as Bellomo fell back into the clutches of Alessandro Chiocchetti. The pair tangled, bringing out the full course caution. When the race returned to green, Bellomo raced up from fourth to second behind Ely, chipping away at her lead for a photo finish at the line. Ely took the Bronze victory, with Bellomo taking the Silver class. 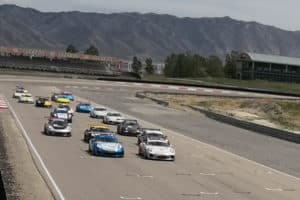 Competent Motorsport President Greg Franz credits the entire paddock – series staff, teams and drivers – for the success of the four-race weekend in Utah. 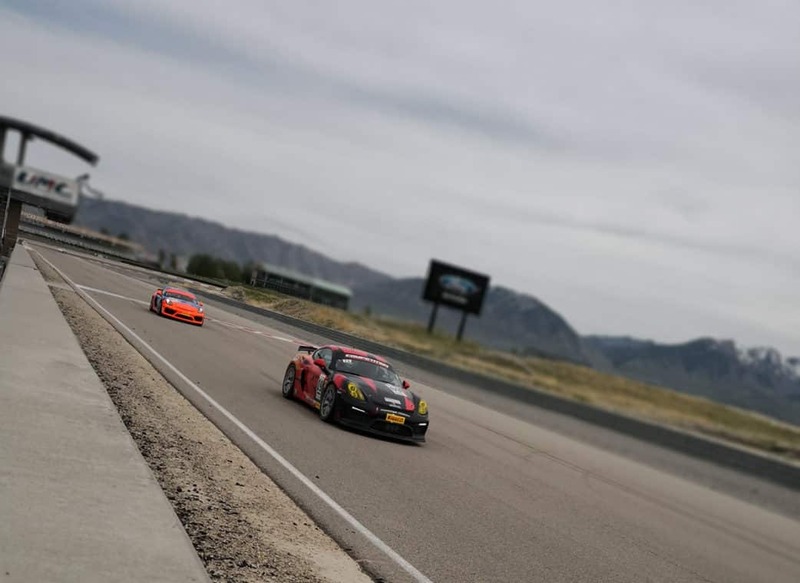 The Pirelli Trophy West USA will be back in action next month, with two races June 8-10 at Thunderhill Raceway Park in Northern California. This entry was posted in News on May 6, 2018 by admin.